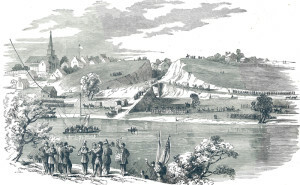 On April 9, 1865, the surrender of the Army of Northern Virginia in the McLean House in the village of Appomattox Court House, Virginia signaled the end of the nation’s largest war. Repasz Band historians were aware that members of the Repasz Band were present at Appomattox at that time. 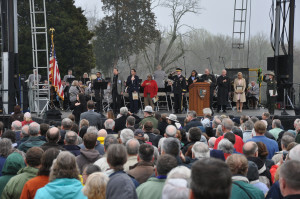 When the National Park Service celebrated the 150th anniversary of the signing, in April of 2015, Repasz thought we should return and “play” our role again in this historic event. Over a two year period we corresponded with the NPS concerning our first participation and in July of 2014, we were issued this invitation. 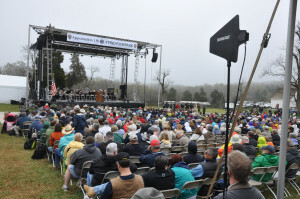 Two bus loads of eager musicians, spouses and friends, along with a few local civic leaders and press, traveled to Appomattox, Virginia for participation on the two day event, culminating in the band playing numerous “period” band pieces for the nationally televised celebration. 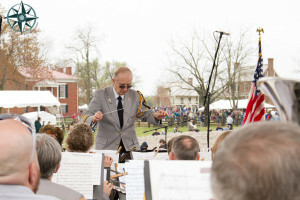 The band was proud and appreciative of our opportunity to participate in this significant celebration and re-establish this connection to our historically important early band members. Pennsylvania Governor, Tom Corbett, sent this letter of congratulations, upon learning of our selection to participate.